Four elegant flamingos strut across the front of this beach tote, creating the picture-perfect look for a day's outing at the seaside, by the pool or on a picnic. The bird's soft pastel colors of pink and purple are neatly enhanced by blue and white horizontal stripes completing the nautical design. Carry the bag using the real rope handles or sling it over your shoulder for a casual look. The design offers a spacious main compartment, ideal to hold all you need. Pair with a blue or pink strapless dress to complete your fresh and carefree summer look. 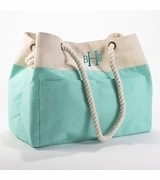 Add embroidered personalization with name, monogram or initial. 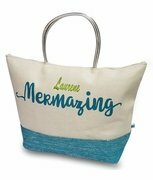 Monogram flamingo beach tote bag measures 22"x 14" x 7" polyester and lined.